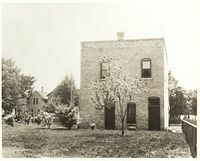 View from rear of building ca 1903. Storefront ca 1933, with winter cold air barrier installed over corner step. Small lower windows allowed natural light into the basement laundry. 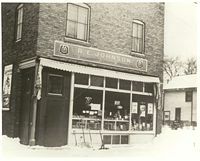 The Johnson Grocery was built by Swedish immigrant and master mason Jakob Emanuel Johannesson (Jacob E. Johnson) in 1903. According to his grandchildren, he was injured in a fall while working on the construction of Minneapolis City Hall, forcing him to find a new profession. He first built a candy store at 2904 East 26th Street (ca 1900; a wooden structure now gone), and later constructed the solid yellow brick building at the corner of 29th Avenue South and East 26th Street. According to an oral history (1982) and census records, at one point three generations of the Johnson family lived in the building. There is a full dwelling above the store, as well as the traditional 'storekeeper's quarters' directly behind the original retail space. In 1951 John Hajicek purchased the building. The property continued as a grocery until approximately 1965. By 1980 the building was automatically rezoned residential, and in 1982 was officially converted to a duplex. Descendants of John Hajicek continue to own and occupy the building. According to the Johnson family, the store was used as a neighborhood polling (voting) location for an unknown period during the early part of the century (ca 1910). Candidate cards (with their platforms) and flags were found when renovating. Children's toys were also found, new (from the store) and used. Old marbles continually wash up in the yard and garden. Jacob and Albertina Johnson were proud of their gardens, and school children were given tours on occasion. During the Great Depression a room was rented out in the basement, and there are memories of sleeping in the yard for relief from the heat during the terribly hot summers of the 1930s. History of major renovation: In 1982 a major renovation was undertaken to bring the building up to code. The building permit of February 9, 1982 authorizes the conversion of the "Store & Dwelling" to a duplex. All of the original wiring and most of the plumbing was replaced; a retrofitted coal boiler was replaced by one of the first high-efficiency boilers; with passive solar energy a popular option after the energy crisis of the 1970s, the large south-facing store windows were retained even though it no longer would be a store. The entire front had to be rebuilt due to rotting wood, and a giant dumpster's worth of crumbling plaster was torn out. The original floor plan was preserved, the woodwork was saved, the floors refinished, old fixtures were rewired, and the store's tin ceiling stayed in place. The masonry and limestone structure was carefully tuck pointed from top to bottom by a highly skilled mason. An added side structure with secondary exit from the second floor (no longer needed for code compliance) was removed and the building was restored to its original footprint. The integrity of the building was guarded as much as possible during renovation. The building is solid masonry (not balloon construction with a brick facade), built three bricks thick. The massive lumber from the turn of the century supports this heavy structure. There is a full basement of limestone, and a clear span in front, with a 13-1/2 foot high tin ceiling in the old store area. The window casings are a foot deep. Noteworthy among the special discoveries during renovation were all of the old store records and a family letter from Sweden hidden under a board in the crawl space between floors. A shoe was also found with the letter. (For good luck?) The records and letter in Swedish were returned to the Johnson family. I lived in this building as a young girl and from 1965 through 1981, and John Hajicek was my great-grandfather. Other children living here included Michelle (Shelly), Allen and John. Collectors: Noteworthy for vintage enthusiasts, this was an IGA store (International Grocery Alliance), founded in 1926. It represents an alliance between manufacturers, wholesalers and retailers; and was created to protect and strengthen their relationships against the growing threat of chain stores. Invoice dated April 24, 1903; notice that the address is 2904 (not 2900) East 26th Street.